Instagram Stories – the Snapchat clone that did it better and is now dominating social media. At just over 2 years old, Instagram Stories has 400 million daily active users so there’s no doubt this killer feature is here to stay. Not only are they fun to use with their face filters, Boomerangs and seasonal content, but these creative 24 hour stories are great for building your brand, increasing engagement and driving traffic to your website. 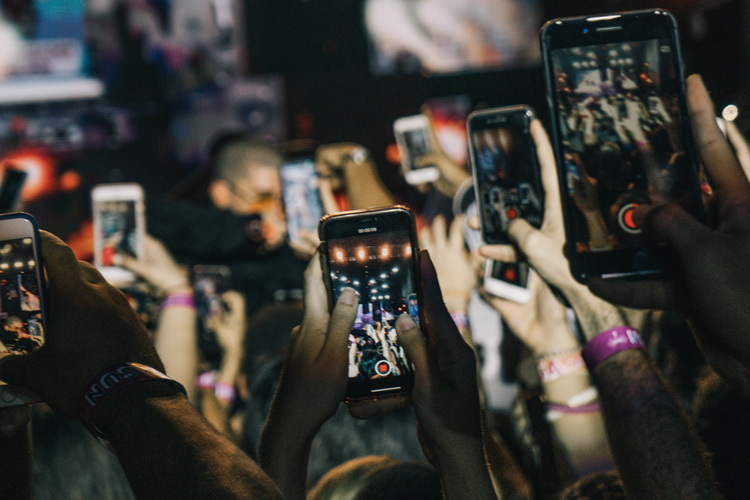 If your business is on Instagram you need to start using Stories to connect with your audience. Since its launch in 2016 there have been many new features, so if you’re late to the party there are a few things to get to grips with. Here’s our 9 step guide on how to get the most out of using Instagram Stories for your business and become a pro user. One of the great things about Instagram is its easy-to-use interface. Within minutes you can be posting away. I’ll go into more detail later in the article about specific features but here’s what you need to know to get started. 1. On the home screen tap on the camera icon in the top left corner or tap on your business logo to the left of the other Stories. 2. The next screen will activate the camera and there are a few icons to choose from. Cog – Control who can see your Stories, reply, or share it. Lightning bolt – Turn on the flash. Central white button – Take a photo by tapping it or hold it down to record a video. Arrows – Switch to the front or rear camera. Smiling face – Activate the face filter. 3. You now need to decide what type of Story you want to create. There are several different types you can create, so see which takes your fancy. Normal – This is the bread and butter of Instagram Stories. Take a new photo, record a video or add a recent photo from your album. Add text, stickers, gifs, draw on it or add the location. Type – Create a text-based Story with a colourful background. Live – Start a live video. Boomerang – Take photos in quick succession, resulting in a looped video. Focus – Find a face to focus on and blur the background. Superzoom – Dramatically focus on a subject with a choice of background music. Rewind – Record a video to play it backwards. Hands-free – A straightforward way of recording a video. Face filter – Apply augmented reality face filters or 3D objects using the front or rear camera. 4. Once you’ve decided on the type of Story you’ll be taken to the final stage to add your creative touch. Here you can apply a photo filter, add stickers, draw or add text. Filters – By swiping right or left you can apply filters to the whole image. Stickers – Tapping on the stickers icon will reveal a catalogue of stickers, ranging from; location, time, temperature, large icons and emojis. Draw – Tapping on the drawing icon will let you draw on your photo. Choose from; a pen, highlighter, neon and chalk. Text – There are several fonts available; strong, classic, modern, neon and typewriter. The text can be in any colour and some fonts have the option to have a background colour. 5. You’re ready to post your first Instagram Story! Tap on “Your Story” icon at the bottom of the screen and it’ll be uploaded for everyone to see. These 2 options are great for getting your Story in front of more people. By adding a location sticker (or hashtag) to your Story it can appear in the Story for that location/hashtag. This means that people who aren’t following you can view your Story and you can potentially gain some new followers. To add a location, tap on the stickers icon and then location sticker. Next, search for the location you’re in if it isn’t already listed and select the relevant one. To add a hashtag, tap on the hashtag sticker and type the hashtag you want to use. You can only use the hashtag sticker once per Story. However, you can include multiple hashtags if you include them using the text function. Pro tip: You can resize, rotate and change the colour of the stickers by tapping on them. For the first time, other than the link on your profile, Instagram have allowed you to add a link. If you’re lucky enough to have over 10,000 followers you’ll be able to use this feature. If you’re eligible you’ll see a link icon next to the stickers icon at the top of the screen. Simply enter the website address you want people to visit and when the Story is published there will be an animated “see more” icon and text at the bottom of the screen. So keep gaining those followers to be rewarded with this super useful feature. There’s nothing like a good gif to bring your Story to life. Tap on the stickers icon, then tap on “gif”. Trending gifs will be shown first but you can search for other gifs by typing in the search bar at the top of the screen. Pro tip: If you have a gif option on your standard keyboard you can add them by using the text function. Creating polls and questions are a valuable way to make your audience engage with you. Polls give your viewers a choice of 2 answers only. You don’t have to stick with a simple yes/no, you can type a specific answer in the boxes. Once they have voted they will instantly see the result of the poll. There are 2 types of question-based stickers. The first is the emoji slider. This gives you option to ask a question and viewers respond by sliding an emoji of your choice on a scale of 1-10. Once they have responded it will show if their response is average or common. It’s a good way of getting the general opinion of your viewers and it’s a bit of fun. The second type of questions is a direct question where people can give a response. You’ll be able to see the answers when you check who’s seen your Story (see step 9). When you receive an answer you’ll have the option to share it on a new Story and add your answer using the text function. It’s valuable for having an interactive question and answer session if you don’t want to do a live video. This is one of my favourite features and it’s kind of hidden. When you create a video Story you can tag a sticker to a person or object. For instance, you can use the mention sticker and pin it to a person so people know who they are or place an Instagram like above them. To do this, open the video in Instagram Stories. Next, select the sticker you want to use and press on the sticker (3D touch on the iPhone). The video will pause, allowing you to fast forward/rewind the video and position the sticker on the moving subject. Tap “pin” and the sticker will follow them like magic. Unlike a standard Instagram post, Instagram Stories are not affected by the dreaded algorithm feed. This means you can post your Story at any time you like as it will be available for 24 hours. When your followers open Instagram they will have your Story waiting for them. If your followers view your Stories on a regular basis, your Story will be positioned higher in the Story feed for them to easily see. Unfortunately, Instagram Stories only last for 24 hours, but if you don’t want the fun to end you can highlight your favourite Stories on your profile. You can choose to highlight a single Story or group them together if they are part of a series. Once 24 hours have passed your Stories will be archived. To access your archive, go to your profile and tap on the plus icon labelled “New” below your profile content. Select the Stories you wish to include in your highlights and tap “next”. Give your highlights a name and choose a cover image for it. When you’re happy to tap “add” and your highlighted Stories will appear on your profile page. You’ve created an awesome Story so naturally, you want to know if all that effort was worth it. To check how many people have seen your Stories you need to open your own Story. At the bottom left of the screen, you’ll see some profile images and “seen by x”. Tap on this to see who’s been looking at your content. If you’ve used a location or hashtag sticker the views from those specific feeds will be grouped together rather than showing individual profiles. Get creative! Instagram Stories is a great tool for businesses to show off and create real engagement. Looking for some inspiration? Here are some Instagram accounts that are getting it right. After reading this guide why not create your own Instagram Stories and let us see? Either follow us on Instagram, @wearemechanised or leave your Instagram account in the comments below. We’ll look forward to seeing them. Find out what feature is coming next from Instagram.